The Hyde Park Shopping Center has suffered long vacancies over the past three years, but is now close to being fully leased. HYDE PARK — The Hyde Park Shopping Center is starting to regain retailers and the owner, the University of Chicago, said the center should be full by the end of the year. 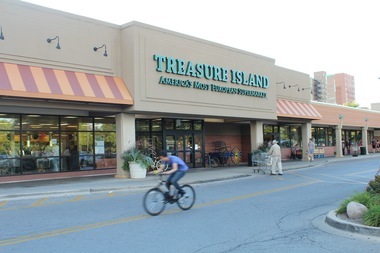 The shopping center in the neighborhood anchored by Treasure Island and Walgreens has found tenants for two locations that have been empty for over a year, though another remains vacant. Happy Nails will open its second location at 1508 E. 55th St. in the interior courtyard of the building in the fall, according owner Nancy Nguyen’s daughter, Jenny Nguyen. “She just really liked the environment, she was attracted to it,” Nguyen said of her mother’s decision to lease in the shopping center. The storefront was last occupied by What the Traveler Saw, but has been vacant since 2014. Rosin Eyecare, 1548 E. 55th St., will expand to take the adjoining storefront, the space with arguably the highest foot traffic nestled between anchors Walgreens and Treasure Island. The space has been vacant since Amy’s Candy Bar ended its run as a pop-up shop in 2015. That leaves just the former DJ’s Bike Doctor store empty. “Hyde Park overall has seen an influx of new retailers that has helped to drive interest in retail space throughout the neighborhood, including the Hyde Park Shopping Center, which we expect to be 100 percent occupied by the end of the year,” said Calmetta Coleman, spokeswoman for the university. She said the university has recently been making investments in the shopping center, including new landscaping, lights and benches. She said there remains strong interest from retailers in the shopping center. The university has not been as aggressive in filling storefronts in the shopping center as it has been on 53rd Street. Storefronts have been left empty for up to three years while actively recruiting businesses on 53rd Street. Nguyen said her mother was not recruited by the university, but actively sought out the location. Wallace Goode, director of the Hyde Park Chamber of Commerce, said it’s always been difficult to be one of the smaller stores in the shopping center. “You’ve got the big tenants on the sign, people don’t even know you’re there,” Goode said. He said businesses have complained that events like jazz concerts bring in new people, but they are there to listen to music, not to shop, and they tie up the shopping center’s biggest asset, its parking. Goode said it’s time to modernize the signs to help businesses compete with the higher foot traffic on 53rd Street. He said a survey of residents in the past year found people wanted businesses like a bar, children’s clothing store, musical instrument store or home goods to move to that part of the neighborhood. New Balance closed its location next to the shopping center in February citing low sales.